James J. Hill, “the Empire Builder,” was one of the leading businessmen of America’s Gilded Age. Hill gained wealth and fame from building the Great Northern Railway into an extremely successful transcontinental railroad. By the time he died in 1916 he had amassed a fortune worth $63 million. Yet for all of Hill’s renown, there are very few biographies of him. An official biography by Joseph G. Pyle appeared in two volumes in 1916 and 1917, but it wasn’t until 1976, sixty years after Hill’s death, that Albro Martin wrote what’s considered the definitive biography of Hill, James J. Hill and the Opening of the Northwest. 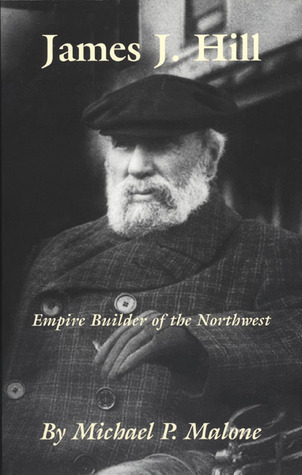 Michael P. Malone’s excellent 1996 biography of Hill, James J. Hill: Empire Builder of the Northwest, fills a needed gap as a concise look at Hill’s life and career. Part of the University of Oklahoma’s Western Biographies series, Malone’s book is an excellent biography, it’s well-written, engaging, and it gives the reader a good sense of Hill’s personality.James J. Hill was born in Canada in 1838. The child of Irish immigrants, Hill had only an 8th grade education, but an unstoppable work ethic. Hill came to Saint Paul, Minnesota in 1856, and he quickly became a successful shipping entrepreneur. Hill didn’t enter the world of railroads until 1878, but his background in transportation helped him immeasurably. He understood transportation systems in a way that few other railroad tycoons did. As Malone writes, “…his knowledge of the railroad, in even the most minute detail, quickly became a matter of legend. For example, while standing on a Dakota rail siding one day, he spotted an engine numbered 94. From that recognition, Hill astounded the engineer by walking up and addressing him by name-Roberts-and noting that the engine had just been in for repairs.” (Malone, p.80) Malone shows readers why Hill was so successful, as he writes, “His genius lay precisely in his ability to master detail while fashioning broad vision and strategy.” (Malone, p.80) Malone does a very good job of discussing the many different parts of Hill’s railroad empire. Even if you’re not a business scholar, Malone makes it easy to follow the various investments and business interests of James J. Hill. Hill was certainly not perfect, but there’s much to admire about him. He was a very smart man who worked extremely hard in making the Great Northern Railway the best railroad it could possibly be. Hill was a difficult person to get along with, but I think most people who are truly driven to greatness are difficult people. If you’re looking to learn more about Minnesota’s “Empire Builder,” or if you’re interested in railroads during the late 19th and early 20th century, Michael P. Malone’s James J. Hill: Empire Builder of the Northwest is an excellent read. More a history of the Great Northern railroad than Hill himself, it covers the various pursuits of Hill building his vast empire of business in Minnesota and beyond. He died in 1917 with an estate valued at nearly $53M - not bad for a poor farm boy from Ontario. Michael Malone, former president of Montana State University, does a wonderful job of showing a balanced portrait of a man with many shifting personas. Hill himself seems to be almost forgotten in the scheme of legendary businessmen -- the man who was dubbed the Empire Builder -- remains only with an Amtrak train that uses that moniker. Malone acknowledges that his biography is only meant to touch the surface and not to dig extremely deep as other authors have done. I recommend this book that is part of the University of Oklahoma Press series. If you ever need a cure for insomnia, I have a recommendation for you! I only got as far as the 2nd chapter. I couldn't get into it so I just returned it. I didn't care for how the story was written and I wanted moe about Hill than about his trains.